George Phydias Mitchell was raised as a child of meager means who, throughout his life, believed in giving back to the community that made his success possible, and lending a hand to the less fortunate struggling to reach their potential. These actions were part of an interesting life that focused largely on the benefit of others. As his fortune grew in the energy business through Mitchell Energy & Development Corp., his wife, Cynthia, and he shared a vision that the majority of the wealth that they had created would be dedicated to making the world a more hospitable and sustainable place for society. In 2010, he joined the Giving Pledge sponsored by Warren Buffet and Bill and Melinda Gates, making public his and Cynthia’s long-held private intent that the majority of their wealth would be donated to charitable causes. George was born on May 21, 1919 in Galveston, Texas, to Greek immigrant parents as the third of four children. His father was a hardscrabble gambler and entrepreneur who owned a series of cleaning and shoeshine businesses. Though poor, George remembers a modest home over the cleaning business where his mother always welcomed Greek immigrants looking to gain a foothold in this foreign land. His mother died when he was 13 but impressed upon him at an early age the importance of an education—a sentiment shared and carried on by his father. Always an ace in math and a star student, he went on to Texas A&M University to study Petroleum Engineering and Geology. Making ends meet in college was tough for George. He waited tables in the residence halls; he sold candy; he built bookcases; he had a tailoring concession. Through determination—and with the occasional monetary help from his father’s poker buddies—he managed to stay enrolled. By his junior year, he attained his first financial success by selling gold embossed stationery to lovesick young cadets. In 1940, George graduated number one in his class in Petroleum Engineering and began work at Amoco in the oil fields of East Texas and Louisiana. But with World War II raging in Europe, he soon joined the Army Corps of Engineers and served throughout the war. Cynthia Loretta Woods was born in New York City in 1922, moved to Carollton, Illinois as a child, and was raised by her single mother with the help of extended family during the Great Depression. After high school, she moved with her mother and twin sister, Pamela, to Houston. As teenagers, the twins became the primary breadwinners of their small family while at the same time studying fine arts, literature, and psychology at the University of Houston. On one Thanksgiving Day train ride after attending a Texas A&M vs. University of Texas football game with her sister and friends, the radiant Cynthia met George, and he soon recognized the depth of her wit and character. George and Cynthia were married in 1943. As luck would have it, George was stationed in his hometown of Galveston overseeing engineering projects with the Corps while Cynthia worked as a civilian secretary to a military officer. In 1945, the Mitchells had their first child. When the war ended, the Mitchell family moved to Houston where George’s brother, Johnny, had begun to make inroads in the oil business. George started work as an independent consulting geologist and petroleum engineer, taking a modest fee and a small piece of the prospects he developed. In 1947, George bought a small interest in one of his exploration clients. Johnny Mitchell joined the company as well, pairing the brothers under the banner Oil Drilling, Inc. with its founding partner, oil broker H. Merlyn Christie. At the wildcatting exploration outfit, George would do the geology and engineering while Johnny and Mr. Christie would sell the deals, often over the lunch counter at the Esperson Drug Store in downtown Houston. With George’s success at finding petroleum, they soon assembled a stable of ready investors from among some of the area’s wealthiest residents. The discovery of one of the largest gas fields in North America began with a deal presented to the team by a Chicago bookie in 1952. The lease acreage being sold was in an area north of Fort Worth known as “The Wildcatters’ Graveyard,” but George saw something in the geology that others had missed. So, Oil Drilling, Inc., along with their loyal investors, bought the deal and within short order drilled 13 successful wells that proved George’s thesis. By the end of 1953, the small outfit from Houston risked it all to lease over 300,000 acres in the play. That North Texas discovery became the backbone of the company for decades to come as well as the major source of the wealth of George and Cynthia Mitchell. The 50s brought continued drilling successes to the young company as well as an important, hard-won 20-year deal to deliver the large quantities of natural gas that they were developing in North Texas to market in Chicago. The risks and the capital demands were enormous for the fledgling company, and this was wearing on Merlyn Christie. So, in 1962 the Mitchell brothers—having already bought out a group of minority partners—acquired Mr. Christie’s share and reorganized under the name Mitchell & Mitchell Oil & Gas Corporation. By 1964, Mitchell & Mitchell owned over 1,000 producing wells, and George and Cynthia Mitchell had 10 children. Throughout the 50s and 60s in Houston, Cynthia had more than most could handle in their household. Nonetheless, she assumed an astounding number of volunteer positions. She led multiple troops of Brownies, Girls Scouts, Cub Scouts, and Boy Scouts—often at the same time—while serving on the board of the Girl Scouts. She was active in the Parent Teacher Association, and she led the church summer school. In everything she did, her clever skill with language and creative spark were somehow always present in even the smallest gestures. Her tireless dedication to community, school, and church activities seemed boundless. But her motives went beyond fulfilling her own sense of duty to contribute to the world around her; she was focused also on creating a culture of generosity within her own family. At Christmastime she wrapped hundreds of gifts with her children, then loaded the station wagon with packages and family to deliver presents to the less fortunate. When volunteering for the United Fund (now United Way), she would canvass the neighborhood with her flock of youngsters in tow, collecting donations door-to-door. She spoke eloquently about the mysteries of the natural world while driving her children to the nation’s great parks and natural areas to draw the distinction between unspoiled natural wonder and mankind’s heavy footprint. And to emphasize the point further, she introduced a recycling program in the household before most people even knew what recycling was. The lessons in her example encouraged George, too. During the 60s the couple began to participate in conferences that opened their eyes to the sources of and solutions to social problems. In the wake of riots, they visited the violence-torn neighborhoods of Watts and Bedford-Stuyvesant to better understand how poverty and prejudice were destroying America’s cities. George and Cynthia met many of the thought leaders of their day. They took a particular interest in global growth issues, contemplating how a resource-constrained world could increase in population and offer opportunities for prosperity and social justice while still protecting its environment and the delicate earth systems that make life possible. George and Cynthia both knew that, as a corporate and civic leader, George had an important role to play in making the planet a sustainable place. As Mitchell & Mitchell Oil & Gas Corporation grew exponentially, it expanded into natural gas processing, transmission, drilling services, and real estate. Among its holdings were 50,000 acres of timberland north of Houston. George loved the beauty of the piney woods and always insisted on a sustainable timber harvest that was gentle on the ecosystem. But his mind and learning directed his efforts toward a greater purpose for the lands that would provide profit for his corporation while contributing socially to the betterment of the Houston area. In the mid-60s, Mitchell & Mitchell assembled a contiguous tract of 27,000 acres off Interstate 45 north of Houston with a portion of the company’s timberlands at the core. George had nothing less on his mind than to create a new town, one better conceived than the decaying urban centers that had so concerned him and Cynthia. He envisioned a community of 120,000 residents comprising different races and socio-economic strata and living in harmony with nature within the piney woods. He knew that, to prevent his new town from becoming just another suburb, he also needed to attract business and build an employment base so residents could walk or bicycle to work. George worked with some of the most forward-thinking urban planners of the time. In a move that was unusual and progressive for developers of the late 60s, they created their plan around the natural hydrology of the land and wildlife corridors. In the hierarchy of priorities, nature came first. The new town would be christened The Woodlands. With construction underway in The Woodlands, George’s energy and real estate development company went public on the American Stock Exchange as Mitchell Energy & Development Corp. in 1972, with George retaining about 60 percent of the stock. As George’s profile in the regional and national business community grew, he searched for ways to bring attention to the issues he thought important. More and more he began to allocate his energies and resources toward projects that would benefit society and enhance human knowledge and understanding. A book titled ‘Limits to Growth’ inspired him to act. Published in 1972, the book addressed the twin problems of population growth and resource depletion, concluding that the path forward at then-current rates of consumption was unsustainable. George called one of the authors, Dennis Meadows, and asked what someone in his position could do to address this global threat. Together they devised The Woodlands Conference, a symposium open to the public dedicated to “growth issues” that would convene the leaders of the field to discuss, present, and debate. George and Cynthia also established a cash prize for the best submissions. 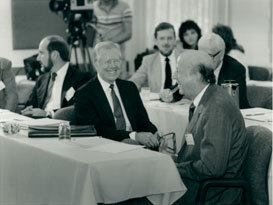 The first conference was held in 1974, with six more taking place over the next 28 years. Avant-garde for its time, the participants at the conferences are recognized today as the pioneers of the sustainability movement. The new town of The Woodlands opened to the public in 1974. Today, The Woodlands is home to 100,000 people and a multitude of corporations. It is recognized internationally as the first master-planned sustainable community. Though The Woodlands was the company’s high profile project through the decades following its opening, it was the ever-growing energy side of the business driven by George and his bold team of geologists and engineers that continued to build the fortunes of the company’s stockholders. With the financial security that came with their growing wealth, Cynthia and George began to give even more generously. And they began to take on business ventures outside of the publicly traded company that, while too risky to be considered investments, balanced the risks by providing social returns. In these endeavors, they focused primarily on Galveston. George and Cynthia always considered Galveston Island, where George grew up and where they had lived together just after their marriage, a second home. They shared an affinity for this eclectic seaside town, and, as civic leaders, looked for ways they could contribute to the town’s fragile economy. In the 70s and 80s, they partnered to lead the revitalization of Galveston’s historic neighborhoods and commercial districts. Over the years, they bought and carefully restored seventeen 19th Century commercial buildings and gave new hope to a declining urban core. Such rebirth was cause for celebration, so together they reintroduced the long-dormant Mardi Gras festivities to the island. Today, with more than $125 million invested through Mitchell Historic Properties, the holdings total over 300,000 square feet of commercial space, loft apartments, and three hotels, mostly within the Strand National Historic Landmark District. In 1982, another vision of George’s was realized in the opening of the Houston Advanced Research Center (HARC) in The Woodlands. George had long felt that Houston’s economy was too dependent on the petroleum industry, so he conceived an institution modeled on the research triangle of North Carolina that would foster diversification of the Houston area economy. With facilities and start-up capital funded by George personally, along with Mitchell Energy & Development Corp., HARC began in partnership with four regional universities as a broad ranging center dedicated to basic, applied, and policy research funded by contracts, grants, and gifts. HARC has since narrowed its mission and today serves as a non-partisan research organization dedicated to advancing technologies and policies that support regional sustainability. Also in The Woodlands, George and Cynthia founded The Cynthia Woods Mitchell Pavilion. Inspired by Cynthia’s passion for the arts coupled with her commitment that the arts should be accessible to all—not locked away in exclusive temples for the elite—she and George resolved to provide The Woodlands and the North Houston area with a first-class outdoor venue for popular and classical music, opera, dance, and the performing arts. Cynthia became a spirited board member and served until 2003. Driven by Cynthia’s belief in the transformative powers of the arts, the Pavilion developed a robust educational program that continues to this day. In addition to her work with George, Cynthia pursued diverse philanthropic interests of her own during the 80s and 90s. Tapping her creative capacity and her love of restoration, she was selected by the National Trust for Historic Preservation to serve as a board member. Within that organization, she and George endowed the Cynthia Woods Mitchell Fund for Historic Interiors, for which she also participated as an active member of the grants selection committee. As a passionate environmentalist, she donated time and money to various wildlife organizations and underwrote art exhibits at the Houston Museum of Natural Science, which focused on endangered species. Cynthia, lover of the arts and letters, sponsored a Distinguished Authors program at the University of Houston; she was an active patron of the Houston Symphony, the Houston Grand Opera, and the Houston Ballet. With special attention to youth in the arts, she generously supported the Houston Youth Symphony and Ballet and University of Houston’s Texas Music Festival, which draws talented music students from across the country and, through four weeks of intensive training, prepares them for careers in music. The festival also features the Cynthia Woods Mitchell Young Artists Competition. As a compassionate defender of childhood physical and emotional well-being, she was a sponsor of Kid-Care, The United Way, and she provided initial funding to establish the Global Children’s Foundation, headed by Nobel Peace Prize laureate Betty Williams, to provide safe havens for children affected by war. As active as they were in philanthropic endeavors, George maintained a keen focus on growing his energy and real estate business. By far the biggest discovery of Mitchell Energy & Development Corp. came in the late 90s, and it stands as a testament to the intellect, optimism, and perseverance of George Mitchell. The discovery was not a new oil or gas field, but rather a technique that the company developed to economically extract natural gas from otherwise unproductive shale rock. Beginning in the early 80s, George and his team of engineers and geologists began testing new technologies in the shale formations of the company’s North Texas gas fields. It was common knowledge that the formation contained high volumes of natural gas, but it was also conventional wisdom that the hard, “tight” rocks would never give up their hold on the prize. Against the prevailing sentiments both within and outside the company, George persisted through 17 years of failures and incremental successes. Finally, as he approached his 80th birthday, gas from these experimental wells began to flow in hugely profitable volumes. Mitchell Energy & Development Corp. merged with Devon Energy in early 2002. At that time, it was estimated that half its value resided in the thousands of undrilled locations on its holdings in the Barnett Shale of North Texas. Ironically, a portion of this tremendously lucrative “new” gas field was the same prospect pitched to George and his partners in 1952 by the bookie from Chicago—a field the company had been exploiting from other geologic zones for 50 years. During his career, George participated in approximately 10,000 wells, including more than 1,000 wildcats. He and his company found upwards of 200 oil and 350 gas discoveries. The impact on the natural gas industry of George Mitchell’s biggest “discovery” is incalculable. Today a shale gas boom has ensued in North America, and the prospect of enormous reserves around the world are just beginning to be understood. It is certain, however, that shale gas reserves alone can supply decades of global natural gas demand. With the financial liquidity that accompanied the sale of Mitchell Energy & Development Corp., George and Cynthia were able to pursue their philanthropic interests at an entirely new level. In 1979, George and Cynthia established the Cynthia and George Mitchell Foundation. The total lifetime gifts from George and Cynthia and the foundation are estimated to be more than $400,000,000. In 2011, George Mitchell joined the Giving Pledge sponsored by Warren Buffet and Bill and Melinda Gates. In doing so, he made public his and Cynthia’s long-held private intent that the majority of their wealth would be donated to charity. The Texas-based not-for-profit organization is a grantmaking foundation that seeks innovative, sustainable solutions for human and environmental problems. The foundation works as an engine of change in both policy and practice in Texas, supporting high-impact projects at the nexus of environmental protection, social equity, and economic vibrancy.The foundation currently funds four grantmaking programs focused on issues related to Water, Sustainability Science, Clean Energy, and Natural Gas Sustainability. The foundation also earmarks a percentage of funds for projects outside of its grantmaking programs, including Cook’s Branch Conservancy, the Mitchell Institute for Fundamental Physics and Astronomy at Texas A&M University, and the Giant Magellan Telescope Consortium. The foundation has also funded a number of notable initiatives for organizations related to science, environmental sustainability, medical research, and the arts, including the National Academy of Sciences, the Houston Advanced Research Center (HARC), the McDonald Observatory at the University of Texas at Austin, the MD Anderson Cancer Center, the National Trust for Historic Preservation, and the Cynthia Woods Mitchell Center for the Arts at the University of Houston. Until his passing, George went to his office four days a week overseeing his numerous ventures and pursuing his philanthropic interests. He spent his weekends in Galveston where, by tending to his historic properties, his work continued. Cynthia was diagnosed with Alzheimer’s Disease in 2002 and slowly receded deeply into her own world, far from the people and activities she loved. Cynthia passed away December 27, 2009.